Compared to some of its competitors, Thermaltake is a rather young company. It was founded in Taipei County in 1999, and since then, it has become the go-to component company for many PC builders, enthusiasts and gamers. I've had friends of mine who weren't too well-versed in PCs request Thermaltake parts, so there's something that the company has done very right. After the company's founding, it produced computer chassis, power supplies and cooling products, but it has recently been on the path of major expansion. A couple of years ago, the company launched its LUXA2 brand, which features higher-end components and mobile accessories. In continuing this expansion, the company announced earlier this year its foray into professional gaming accessories, and the fruits of that are finally beginning to come to market. It's important to note that these gaming products aren't part of a series put out by Thermaltake, but rather are categorized under a different branding, "Tt eSPORTS". At its heart, Tt eSPORTS is still part of Thermaltake, but the company clearly expects enough success to warrant unique branding. This is a trend we've seen other companies do as well, such as Cooler Master with its Choiix brand. We first learned of Tt eSPORTS almost eleven months ago at the CES event, and then saw a slew of related product at Computex this past June. The time to launch here is rather interesting, because the keyboard I'm reviewing today, I used at CES in what seemed like its near-finished form. Thermaltake has proven itself to be a company that doesn't rush things, that's for certain. Closer LookIn talking to Thermaltake at Computex this past summer, I was told that it had enlisted the help of professional gamers in designing its Tt eSPORTS products, although it didn't name names. The company has been active in the LAN party and professional gaming circuits, however, so it can be assumed that it has gathered information via a number of different means. After taking the keyboard out of its box, you'll find it safely stowed away in a bag made of a soft durable material. This is a useful addition not only for shipping purposes, but also for LAN gamers who want a reliable way of safely bringing their keyboard to and from a LAN party. For those who care a lot about the keys on gaming keyboards, you'll likely know right away whether or not the Challenger is for you. I wouldn't go as far to say that these keys are like those found on notebooks, but they are not close to being mechanical offerings either. They're silent and don't offer a lot of feedback, but they're very responsive. The Challenger is going to appeal greatly to those who want a clean-looking board, as there's nothing too flashy here. The only non-black aspect is the red trim at the bottom and also the logo. Like the keys, the Tt logo lights up red when the keyboard is in use (both can be disabled). Similar to many other gaming keyboards out there, Thermaltake has chosen to situate the macro keys to the side, rather than keep them above the F keys. Even further, there are five macro keys on each side, with is appreciated since it minimizes the width of the left side. I don't personally like macro keys to the sides, because I am far too used to the Ctrl and other keys being at the left-most part of the board. When macro keys are shoved in there, I find myself often having to slow down or look at the keyboard to find the Ctrl and Shift keys, and even after more than a week of straight use, I still haven't completely gotten used to that. On the opposite side of the keyboard, you can see the numpad and some multimedia keys up top. As far as layout goes, I've found nothing wrong with where the keys are located, but I do have some other concerns I'll talk more about in the final thoughts section. The status keys are up top, and if one of them is lit up, a red LED circle lights up beside the respective icon. The status icon to the right represents the current macro profile, and rotates between red, green, blue and purple. To make transport easier, Thermaltake doesn't preinstall the USB cable on this keyboard, but instead allows you to install it manually. It seems like a bit of an odd choice, but it doesn't really seem to have a downside, so I have no complaints. At the rear of the board, you'll have access to two USB 2.0 ports, and also be able to store the board's fan in the empty compartment there. Wait, did I just say "fan"? Yes, I did! 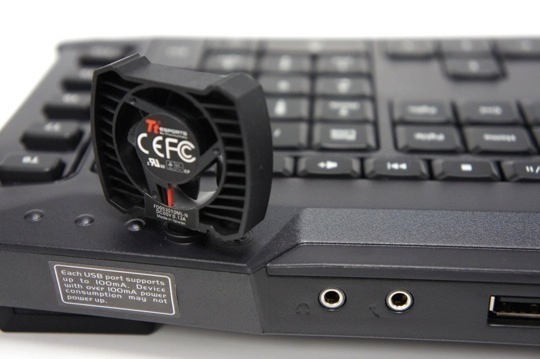 In an interesting twist to the typical gaming keyboard, Thermaltake has bundled a super-small fan that mounts in either the left or right side of the board that aims to keep your hands dry during intense gameplay. Though small, the fan doesn't whine at all, and as you might expect, it's not all too powerful either. This is one of the flattest keyboards I've ever encountered, which is a +1 in my book. It can be raised if you like with the help of two durable legs. To the left of the right leg in the photo, you might notice the mouse cord holder - another plus. I have a couple of mice that either have heavy cords or just keep rubbing against the edge of the desk, so being able to secure the cord is nice. This is one of the flattest keyboards I've ever encountered, which is a +1 in my book. It can be raised if you like with the help of two durable legs. To the left of the right leg in the photo, you might notice the mouse cord holder - another plus. I have a couple of mice that either have heavy cords or just keep rubbing against the edge of the desk, so being able to secure the cord is nice. In way of accessories, Thermaltake bundles in eight extra keys (the color isn't the only change... the surface is a bit rougher, and was preferred by me), a key remover ring, the fan, a manual, USB cable, and a couple of "Windows Key Blockers". What's that, you ask? They are simply flat pieces of plastic that can replace your Windows keys, so as to prevent accidental drops to the desktop while in a game (frustrating, to say the least). I would have also preferred far better spacing of the top row of keys as well. As you can see in the top-most photo on this page, there is no spacing at all between the F keys or any other for that matter. That to me is a concern, because if you play a game where F keys are regularly used, you are likely to have to actually look at the keyboard to make sure you are hitting the right one, and when in the heat of gameplay, that's not good. This isn't a problem on other keyboards because there are three sets of F keys with a healthy space in between each. They helps you find any particular F key quickly, and without looking. But here, they all flow right into each other so the only option is to hit a key and hope for the best, or look away from the screen. "Print Screen" for me was also a chore to use, since again, it's in the same row. Aside from the physical attributes, the software and macros didn't do too much to impress. The program itself is a little finicky, but I do like the fact that it's simple. The biggest problem for me is the lack of being able to create lengthier macros. I haven't taken a stab at a gaming peripheral for as long as I can remember that limited the number of actions to just 20, so it caught me by surprise here. For some gamers, it might not matter, and you should know if it would affect you or not. If you are someone who likes to create grandiose macros, the Challenger Pro is not for you. Not now, at least. Nothing says Thermaltake couldn't improve this in the driver later on. However, I do think the 64KB of on-board memory is the biggest throttle here. Despite the issues, I'm still pleased for the most part with the Challenger Pro, but I do think it could have been improved quite a bit with the help of some small changes. For the price, this keyboard is very attractive, and I'd recommend it if the cons I mention below don't affect you. Comfortable, and easy to type with. Ability to save macro profiles to your PC. Additional textured WASD and arrow keys included. Up to 6 keys can be used at once. Mouse cord routing feature is a nice addition. Backlit keys (featuring three levels of brightness). Very flat bottom, if that's important to you. Lack of spacing in top row of keys. Limiting number of actions per macro. Macro execution is a bit touchy. Included fan is not too powerful.